Nekkid with a Camera checks in with a review of Interface at our Bethesda gallery. Jiha Moon has a wonderful review of her recent show at the Curator's Office by George Howell in the Jan/Feb issue of Art Papers. Unfortunately, it's not online. If Howell emails me a copy of the review, I'll post it here. Darn Knit is a new DC art blog. Mark Jenkins has been at it again. 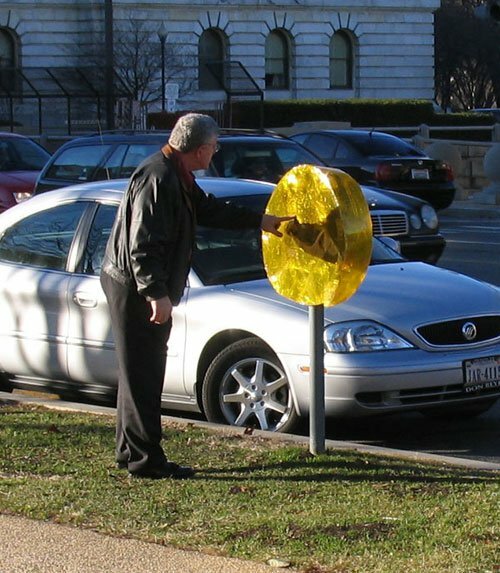 This time he has transformed the parking meters around the Department of Energy into huge lollipops. Ian Jehle is moderating a series of art panels at DCAC and it's time for round two this coming Sunday. On Sunday he's moderating the second panel of the four part panel series "Who Do You Love?" This one will focus on abstraction. The scheduled panelists are: Jonathan Bucci, Isabel Manalo, Jiha Moon, Jack Rasmussen & Robin Rose. The event starts at 7:30 in the theater at DCAC. Thanks to everyone you made it to panel #1 and to the first group of panelists: Richard Chartier, Kathryn Cornelius, Jeffry Cudlin, Brandon Morse and Jefferson Pinder. Scheduled panelists include: Lisa Bertnick, Jonathan Bucci, Richard Chartier, Mary Coble, Kathryn Cornelius, Jeffry Cudlin, Nekisha Durrett, Isabel Manalo, Jayme McLellan, Allison Miner, Jiha Moon, Brandon Morse, Michael O'Sullivan, Jefferson Pinder, Jack Rasmussen, Robin Rose, Erik Sandberg & Ira Tattelman.